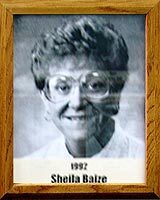 Sheila Baize is a well-known figure in Pima County sports. During her coaching days, she was equally renowned. An alumnus if Catalina High School in Tucson and a graduate (Doctorate of Education) of the University of Arizona, Sheila first picked up her whistle as head volleyball, softball and track coach at SS. Peter and Paul in 1970. Next cam an assignment to Salpointe High School, followed by an incredibly successful 12 years at San Manuel (Arizona) High, where she coached badminton, JV volleyball, basketball and softball. Her softball team had one of the highest winning percentages in America, compiling 185 wins (including 5 State Championships) and only 15 losses. Fifteen of her players received athletic scholarships.